Juwan Morgan repeatedly set ball screens, took charge in the huddles and implored his teammates to keep playing hard. BLOOMINGTON, Ind. 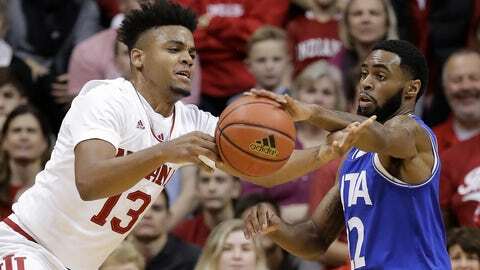 — Indiana coach Archie Miller searched desperately for answers in the second half Tuesday night. Eventually, Juwan Morgan came through. Again. After Indiana extended its 17-point halftime lead to 48-28 with 18:09 to go, Dennis and Warren finally warmed up. Three consecutive threes cut the deficit to 12 and when Radshad Davis made another 3 with 11:49 to play, the Mavericks were within 55-47. Texas-Arlington: The Mavericks have shown promise during this early-season stretch and used a gritty second-half performance to challenge Indiana on its home court. Foul trouble, mistakes and a lack of depth eventually took their toll. Texas-Arlington: Davis had 12 points and David Azore finished with 10. … Jabari Narcis had seven points and seven rebounds. … The Mavericks finished 8 of 29 on threes after going 1 of 12 in the first half and committed 18 turnovers. Indiana: Morgan also had three blocks and two steals. … The Hoosiers were 2 of 12 on threes and 16 of 23 from the free-throw line. They matched their season high with 18 turnovers after committing 13 in the first half.